The Norfolk and Norwich Terriers are originally from Great Britain. They are known for being small, hardy, and industrious little dogs and one of the smallest working Terriers. In the 1800’s they earned respect for their proficiency and expertise in keeping the rodent population under control and were popular with undergraduates at Cambridge University, who used them as both ratters and pets. What is the difference between the breeds? With common ancestry, the breeds were originally considered as the Norwich Terrier including both the ‘prick’ and the ‘dropped ear’ versions. 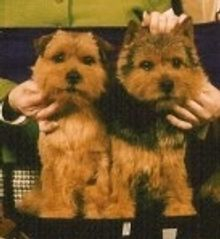 The Norfolk Terrier with the dropped ear was recognized as a separate breed in England in 1964 and later in the United States in 1979. Other differences exist beyond the ear positions. The average size of Norfolk and Norwich Terriers are 10 inches in height and 12-15 pounds in weight. Are they good family dogs? The Norfolk and Norwich Terriers have a happy disposition, they are loyal and intelligent making them a joy to have around. They are almost tireless where children are concerned. They are hardy enough to endure and enjoy children. Are they good house dogs? These Terriers are happy to snuggle in your lap or lay alongside you on the couch while you read or watch television. They are always ready to go for a walk, they are easy to train, intelligent and quick. The Norfolk and Norwich Terriers shed much the same as humans, you might compare it to the remainders of your hair found in a hairbrush. Their coats are harsh and wiry to repel rain and weather conditions. Do they make a lot of noise? For the most part, Norfolk and Norwich Terriers have calm dispositions and are quiet around the house. However, they serve as excellent watchdogs, warning of the unexpected occurrence. How log do they live? The life expectancy of Norfolk and Norwich Terriers is estimated between 12 - 15 years. This summary has been provided by Huntwood Kennels. Reference has been made to the content of suggested reading: Norfolk Terrier, by Anna Katherine Nicholas, and the American Kennel Club. Website: www.akc.org .